DUNGARVAN: Male Velvet Scoter & Slavonian Grebe off Ballynacourty pier; Blackcap at Ballyneety. BALLYVOYLE: 10+ Great Northern Divers, 8+ Red-throated Divers & a Dipper. BOATSTRAND: 4 Common Scoters flew east. TRAMORE BACKSTRAND: Pink-footed Goose, 5 White-fronted Geese & 10 Shoveler at Lisselan; total 45 Gadwall (probably a record count for Waterford). TRAMORE BOATING LAKE: Adult Ring-billed Gull & adult Mediterranean Gull. DUNMORE EAST: 3 Purple Sandpipers. 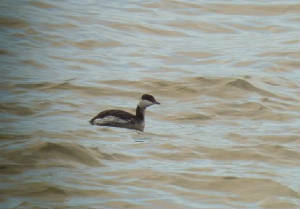 DUNGARVAN: Slavonian Grebe & 2 BLACK-NECKED GREBES off Ballynacourty pier. COOLFIN: 17 Whooper Swans & a Chiffchaff. BALLYSHUNNOCK RESERVOIR: 2 male Pintail, 5 Gadwall, 13 Shoveler & 13 Whooper Swans. 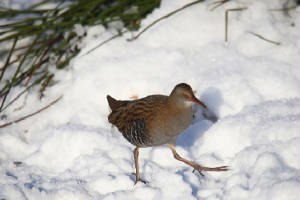 ANNESTOWN: Great Crested Grebe, male Shoveler & 45 Skylarks. TRAMORE: Adult Ring-billed Gull (photo). DUNGARVAN: BLACK BRANT & 5 Shoveler off pitch & putt course. BALLYSHUNNOCK RESERVOIR: 2 male Pintail, 6 Gadwall, 9 Shoveler & a Kingfisher. TRAMORE: Black Redstart at west end of beach. RINCREW: Adult Yellow-legged Gull at Tourig estuary (Waterford & Cork sides). BLACKWATER VALLEY & CALLOWS: c280 Whooper Swans. 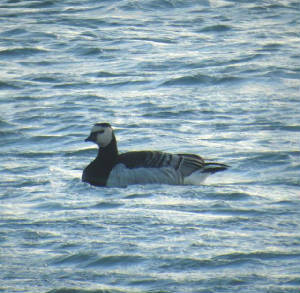 DUNGARVAN: Slavonian Grebe & 2 BLACK-NECKED GREBES off Ballynacourty pier; adult dark-bellied Brent Goose at Quann's; Pintail off pitch & putt course; 2 Shoveler in Western Bay; Waxwing at Ballynacourty; 3 Blackcaps (male & 2 female) at Strandside, Abbeyside; Blackcap & 14 Siskins at Springmount. BUNMAHON: Coot, 55 Teal & 3 Bar-tailed Godwits. 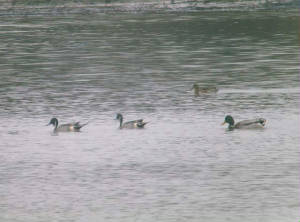 BALLYSHUNNOCK RESERVOIR: 3 Pintail (2 male & 1 female), 3 Gadwall & 8 Shoveler. DUNGARVAN: 2 BLACK-NECKED GREBES off Ballynacourty pier; 2 male Tufted Duck at Ballyneety. WATERFORD CITY: Male Blackcap at Collins Avenue. 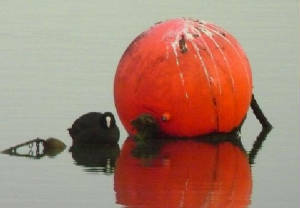 DUNGARVAN: 2 BLACK-NECKED GREBES off Ballynacourty pier; 2 Blackcaps (male & female), Abbeyside for the last 3 weeks. 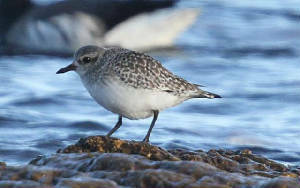 DUNGARVAN: Grey Plover in garden at Seapark, Abbeyside. 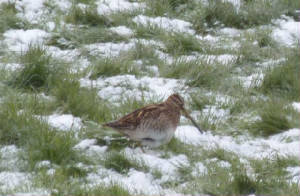 Nr BALLYDWAN COVE: Bar-tailed Godwith & Snipe feeding in garden. 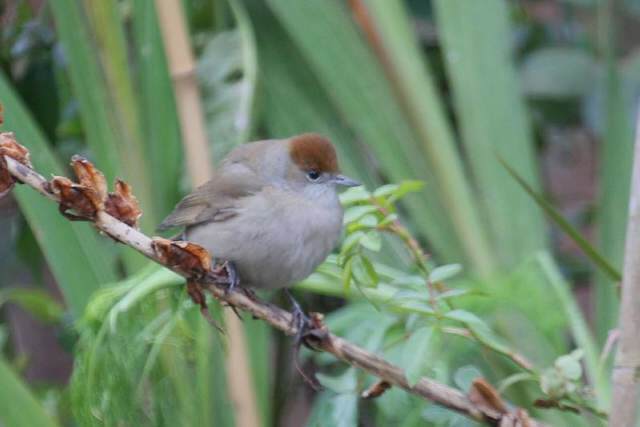 TRAMORE: Blackcap in garden during the last week. DUNGARVAN: 3 Blackcaps (males & female) in town centre; 6 Shoveler at Quann's; Coot & male Tufted Duck at Ballyneety, female Tufted Duck near Lidl. DUNGARVAN: 2 BLACK-NECKED GREBES off Ballynacourty; Black Redstart at Country Life store car-park, Park Hotel roundabout; Coot at the quay. WATERFORD CITY: Male Blackcap at King's Channel. BALLYSHUNNOCK RESERVOIR: 7 Gadwall & 8 Shoveler. WATERFORD CITY: 3 Blackcaps (2 males & a female) at Francis Street. DUNGARVAN: Male & female Blackcap in town centre. 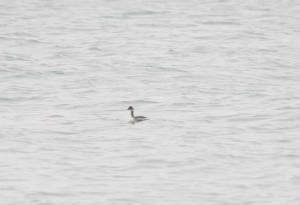 DUNGARVAN: 3 BLACK-NECKED GREBES & female Eider off Ballynacourty pier; female Blackcap in Southways estate. 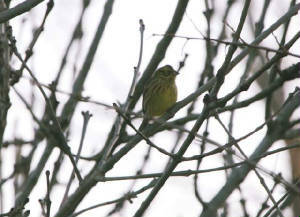 Nr BUNMAHON: Merlin & 20 Yellowhammer at Seafield. CARRICKBEG (Co Tipperary / Waterford vice-county): 5 Goosanders on River Suir near the Co Waterford border. WATERFORD CITY: Male & female Blackcap at Francis Street. DUNGARVAN: Male Blackcap at Southways, Abbeyside; Water Rail & 9 Redpolls at Springmount. 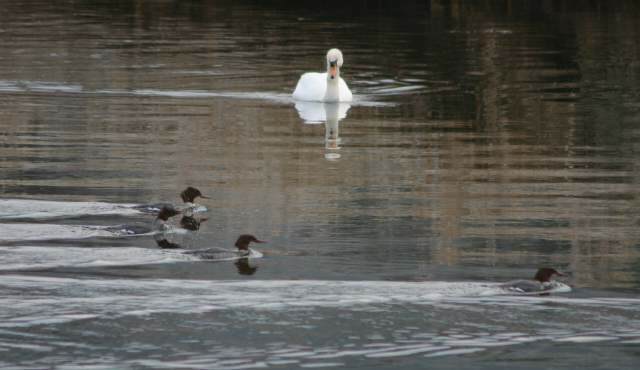 CARRICK-ON-SUIR (Co Tipperary / Waterford vice-county): 6 female or immature Goosanders just upriver. DUNGARVAN: Male & female Blackcap at Strandside, Abbeyside. 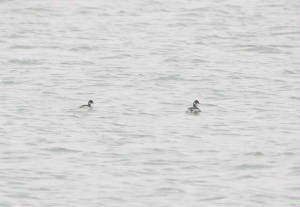 DUNGARVAN: 3 BLACK-NECKED GREBES off Ballynacourty. Nr KILMANAHAN: c45 Whooper Swans at Ballydonagh. DUNGARVAN: Blackcap at Strandside, Abbeyside. 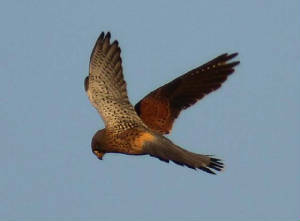 DUNMORE EAST: Merlin near Black Knob. WATERFORD CITY: Male Blackcap at Francis Street. DUNGARVAN: Waxwing & Black Redstart at Abbeyside, BLACK-NECKED GREBE off Gold Coast, Barnacle Goose, dark-bellied Brent Goose & 6 Shoveler (2 male, 4 female) off pitch & putt course, & male Gadwall at Killongford. HELVICK HEAD TO BROWNSTOWN HEAD: c9 Fin Whales including 1 off Helvick & 2 off Clonea. RINCREW: Yellow-legged Gull on Youghal/Cork side. 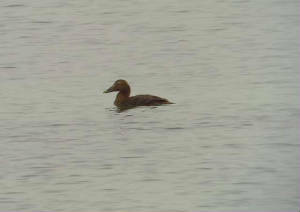 BALLINARD (nr Clonea Strand): Female Eider. 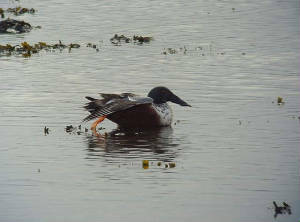 DUNGARVAN: BLACK-NECKED GREBE off Ballynacourty, Barnacle Goose at Ballyneety & 2 male Shoveler off pitch & putt course. 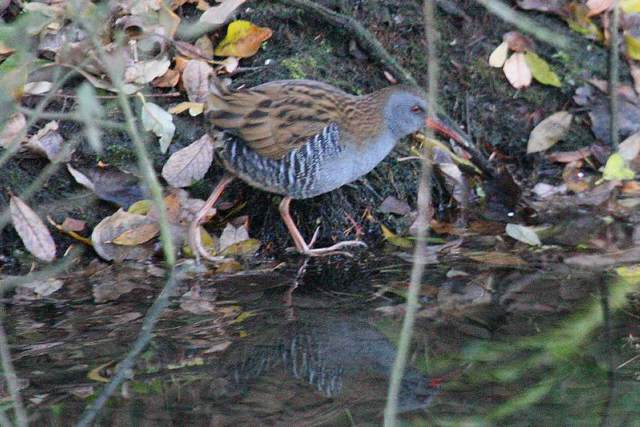 BALLINLOUGH: Kingfisher & Water Rail. Nr BUNMAHON: 20-30 Stock Doves at Seafield; 4 Fin Whales & 2 Minke Whales <1 km off Tankardstown copper mines. Nr DUNGARVAN: Skylark feeding on garden patio at Kilmurray during the continuing cold snap. 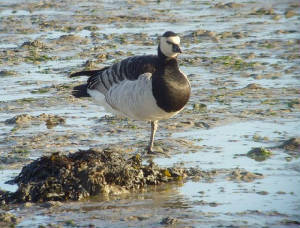 DUNGARVAN: Barnacle Goose, BLACK BRANT & female Pintail off pitch & putt course. 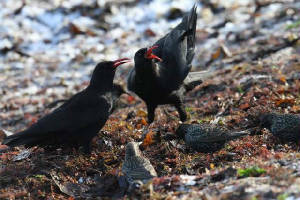 High count of 16 Blackbirds feeding on apples in garden at Shandon. Off MINE HEAD: Male Eider flew east a mile offshore. 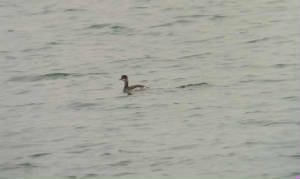 DUNGARVAN: 10 Little Grebes at Ballyneety, Great Northern Diver in western bay. CLONEA/BALLYVOYLE HEAD: 2 Fin Whales. Off BUNMAHON: 6 Fin Whales & a smaller whale. DUNGARVAN: Barnacle Goose, BLACK BRANT & female Shoveler off the pitch & putt course, 50 Skylarks, a Water Rail & 7 Pintail at the Cunnigar; also a Hooded Crow seen to chase & kill at Redshank at the Cunnigar. 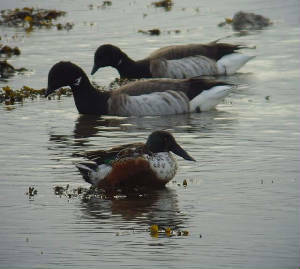 DUNGARVAN: Barnacle Goose, male & female Pintail & 2 female Shoveler near the pitch & putt course. 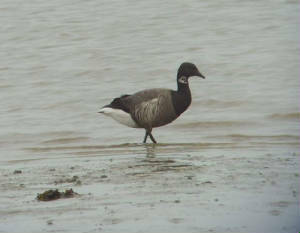 DUNGARVAN: BLACK BRANT & Barnacle Goose near the pitch & putt course, Kingfisher & Chiffchaff at the Brickey canal. 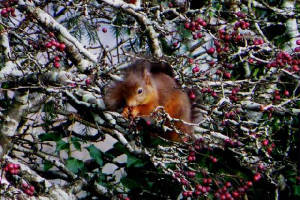 Nr BUNMAHON: Merlin, 2 Kingfishers, Blackcap, Brambling, 6-7 Yellowhammers & an Otter at Seafield. Nr BUNMAHON: Male Blackcap at Seafield. Nr DUNGARVAN: Barn Owl seen at 17:40. 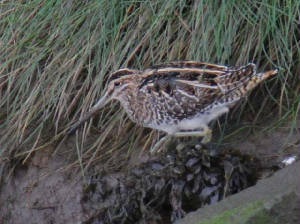 Nr BUNMAHON: Kingfisher, c100 Snipe & male Blackcap at Seafield. 4 Fin Whales & a smaller whale off Bunmahon. 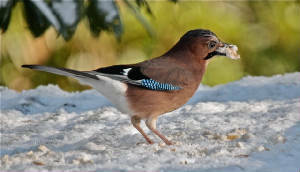 WATERFORD CITY: 50+ Goldfinches in garden near Ballybricken. DUNGARVAN: Female Pintail off sports centre, 38 Skylarks arrived in at pitch & putt course. 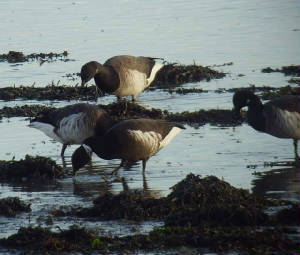 DUNGARVAN: BLACK BRANT at the Cunnigar. DUNGARVAN: 2 SPOONBILLS near pitch & putt course, Kingfisher at Barnawee. TRAMORE BACKSTRAND: c400 Brent Geese. DUNGARVAN: 4 SPOONBILLS at the Cunnigar. Nr WATERFORD CITY: Long-eared Owl. 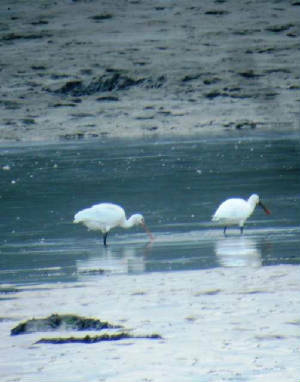 DUNGARVAN: 3 SPOONBILLS near pitch & putt course. Nr BUNMAHON: 2 Green Sandpipers at Seafield. 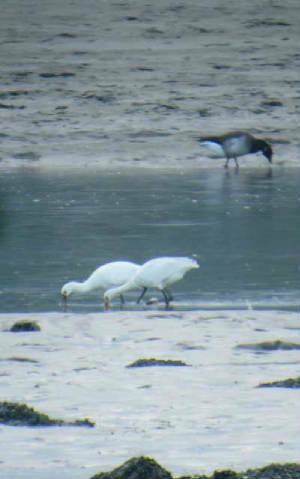 DUNGARVAN: 2 SPOONBILLS at the Cunnigar. 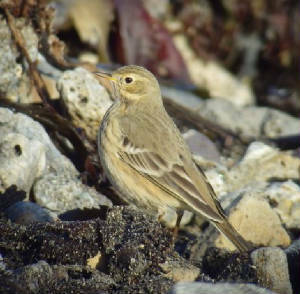 CLONEA STRAND: BUFF-BELLIED PIPIT& WHITE-RUMPED SANDPIPER at Ballinclamper. CO KILKENNY: GOLDEN EAGLE (reintroduced or escaped bird?). 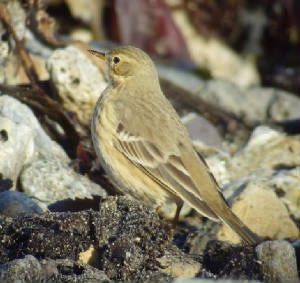 CLONEA STRAND: WATER PIPIT, WHITE-RUMPED SANDPIPER & 4 Purple Sandpipers at Ballinclamper. 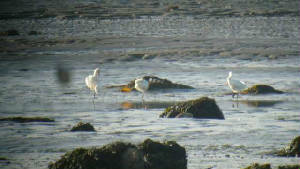 DUNGARVAN: 4 SPOONBILLS at the tip of the Cunnigar. BUNMAHON: c4 Fin Whales offshore. 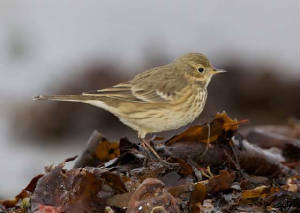 CLONEA STRAND: BUFF-BELLIED PIPIT & WHITE-RUMPED SANDPIPER at Ballinclamper, also a Curlew Sandpiper, Slavonian Grebe & 3 Great Northern Divers; a Swallow east at Ballinard. WHITING BAY: 3 Tree Sparrows. WEST WATERFORD: Buzzard (also 2 at same location recently). TRAMORE BACKSTRAND: 3rd-winter Yellow-legged Gull at Saleen. 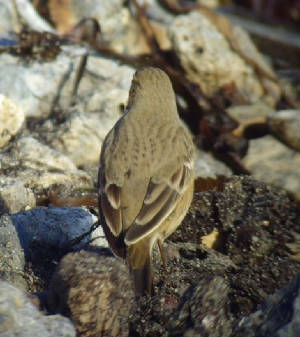 CLONEA STRAND: BUFF-BELLIED PIPIT at Ballinclamper (new bird - not the bird seen 17th-24th October) - 2nd county record - also a Whimbrel, 4 Purple Sandpipers & 31 Choughs. 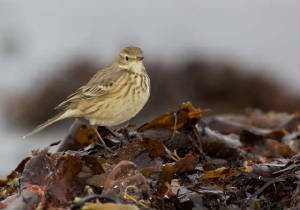 WHITING BAY: 3-400 mixed Redwings & Fieldfares in off sea & 4 Yellowhammers. Nr KILMACTHOMAS: Barn Owl flew across road at 18:15. 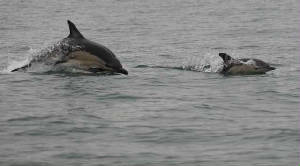 RAM HEAD: Red-throated Diver, 200 Common Dolphins & 2 Red Admirals. CLONEA STRAND: Juvenile WHITE-RUMPED SANDPIPER still at Ballinclamper. 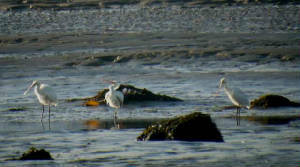 DUNGARVAN: 2 SPOONBILLS by pitch & putt course. Nr STRADBALLY: Brambling, c500 Chaffinches & 3 Red Admirals. CLONEA STRAND: Juvenile WHITE-RUMPED SANDPIPER at Ballinclamper, also a Purple Sandpiper. WEST WATERFORD: Single Buzzards seen at two locations. BLACKWATER CALLOWS: 145 Whooper Swans & a Kingfisher at Ballyneroon. 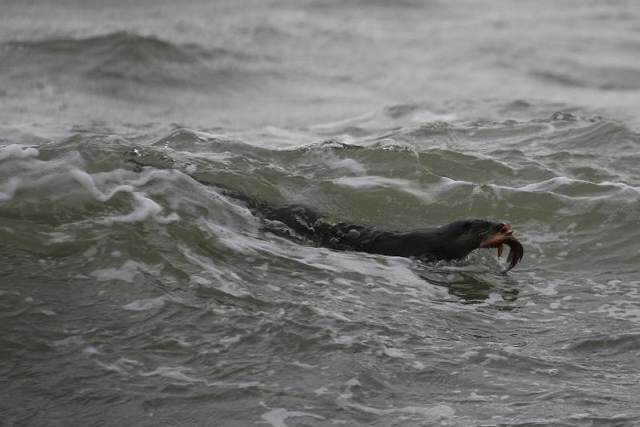 RAM HEAD: 5 Red-throated Divers, 100+ Common Dolphins, 2 Porpoises, a Minke Whale & a large whale species. ARDMORE: 2 Mediterranean Gulls (1st-winter & 2nd-w). HELVICK HEAD to MINE HEAD: 2 Fin Whales offshore. TRAMORE BACKSTRAND: Pink-footed Goose, 7 White-fronted Geese, 3 Whooper Swans & a female Scaup at Lisselan. CORBALLY BEG (nr Tramore Backstrand): Swallow. BROWNSTOWN HEAD: Lapland Bunting, Merlin, 3 Blackcaps & 1+ White-fronted Goose (flew east). 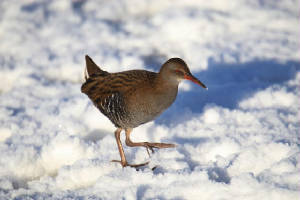 DUNGARVAN: Mediterranean Gull & 20 Snipe at Ballyneety bridge, Swallow at the Quay. DERRIGAL/COOLFIN (nr Portlaw): 40+ Greylag Geese at Derrigal cross roads. Nr BUNMAHON: Chiffchaff at Seafield. WATERFORD CITY: 2 late Swallows at King's Channel. DUNGARVAN: 3 SPOONBILLS flew north high over the pitch & putt course. 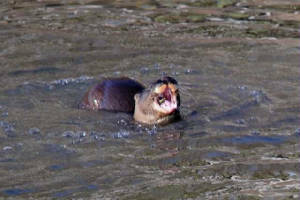 DUNGARVAN TOWN: Otter walking along road at the Mooring's pub at 13:40 (3 Otters at same location on 28 Oct).